Justin Lanier gave a fun, beautiful, challenging, and useful talk at the Global Math Department on Tuesday. His talk centered around teacher’s views of mathematics and how they can affect their student’s views. Please take sometime to watch Justin’s presentation. It’ll make the rest of this post make much more sense! Or at least visit Justin’s blog where he issues a call to action. I took Justin’s call to action and gave a google survey to my colleagues. I sent it in an email to every staff member at my school. This included administrators, math teachers, non-math teachers, related service providers, para-professionals, etc. In other words EVERY staff member at my school had the opportunity to answer Justin’s question. Looks math ain’t that popular ’round these here parts! Boom goes the dynamite. The percentage of staff members who do not like math is more than the next two most popular categories combined. I was not surprised by these results, however. Often when numbers or statistics come up during staff meetings, I’ll hear things like “Ask the math teacher to do it,” or “Uh, I don’t know, I’m not a math person.” If the other staff members at my school are thinking about math in this way then how are we supposed to instill a love or even acceptance of math among our students who are so influenced by these same people? Next, I wanted to share the results of the survey. 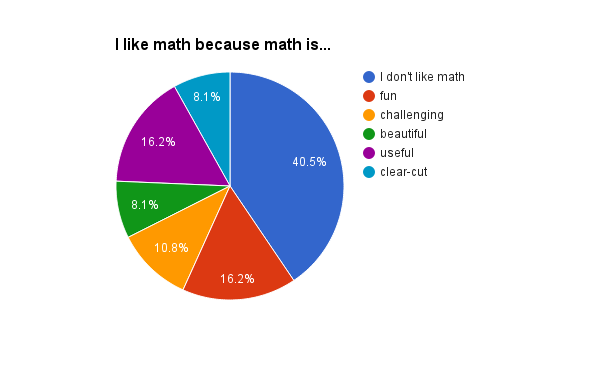 The results show the general feeling about math among the staff at CCA. 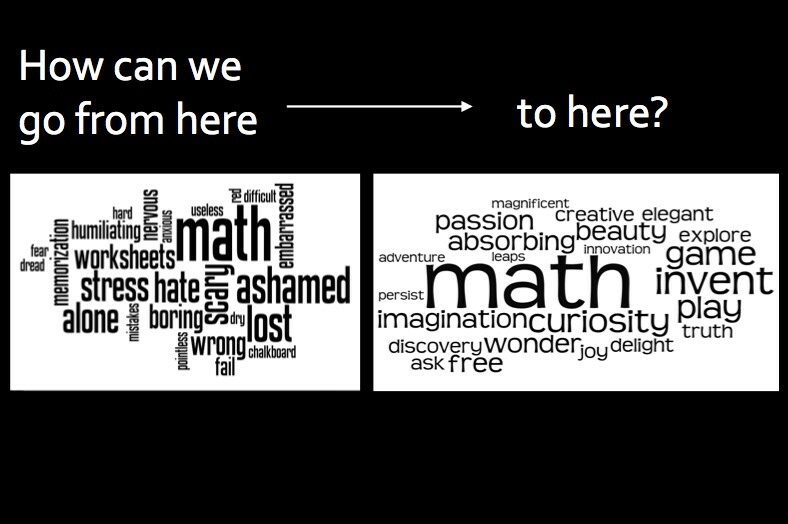 The word cloud on the left was when elementary teachers were asked to use one word to describe their feelings about math. The word cloud on the right is the same task given to mathematicians. Big difference! Our goal should be to help our students feel more like the words on the right than the words on the left and that starts with us! Math Munch – a weekly digest of the mathematical internet. Talking Math with Your Kids – talk about math with your kids at home! Recreational Math Puzzles – solve some math puzzles! Game About Squares – this one is pretty self-explanatory! The word clouds are pulled from Tracy Zager‘s inspirational talk at Shadowcon15 during the NCTM conference in Boston last month. If we are going to change how we as a society view mathematics, we’ll first have to change the feelings of those who most directly influence our society’s future, its teachers. This entry was posted in Uncategorized and tagged call to action, education, global math department, justin lanier, math, math education, MTBoS, Shadowcon15, Tracy Zager by Andrew. Bookmark the permalink. Love this, Andrew. Would you mind posting it in the comments at http://www.shadowmathcon.com/tracy-zager/? Also, just to clarify, I didn’t survey anyone to make the word clouds. They’re unscientific. I read many, many math anxious teachers’ math autobiographies and also conducted lots of interviews. And then I typed the words I kept hearing into wordle. For mathematicians, I did the same thing. I still think they’re fair to use for this purpose. I wanted to illustrate the extremes. If I had done a survey, there would surely be some differences, and hopefully a tiny bit more common ground!